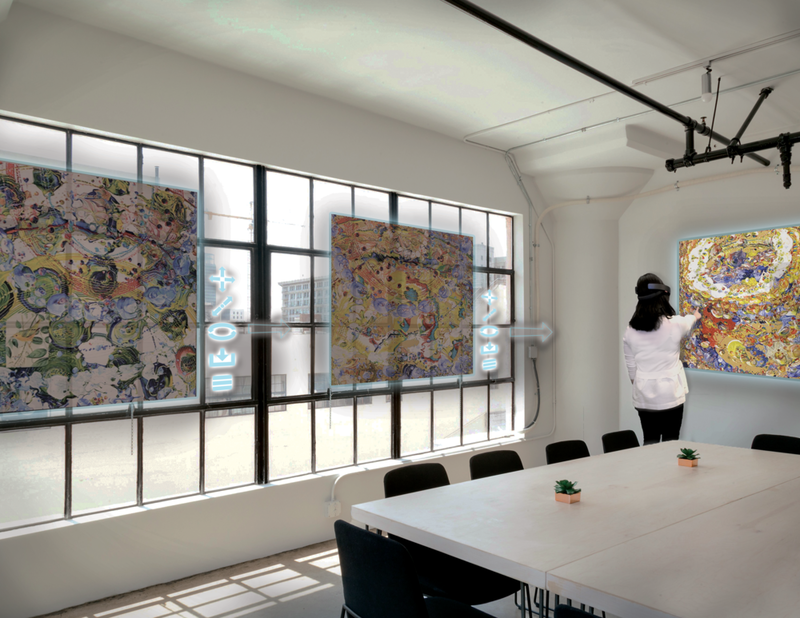 MooR, allows users to virtually enter an artist studio and experience a curated visit. The name of the product is a play on the meaning of the word "moor," which is "a tract of open uncultivated upland," symbolic of the unchartered territory of Mixed Reality (the M & R), and the two middle o's, which in our logo are the HoloLens headset. The product is in the form of a HoloLens app. This design challenge asked: how can we use the versatility of Mixed Reality to interact with and view of 3D objects in 3D space, tell interactive stories using spatial contexts, create interfaces for objects and environments, make the invisible data of the world visible, extend and augment human sensing, and collaborate with perspective? Team: The team for this project included Sara Camnasio, Asher Friedman, Sharon Lee, Shuling Chen and Aniket Bhandarkar. My role was Concept and Interaction Designer, as well as Lead Unity Developer. Methods: MR Reality Design Assessment, Competitive analysis, User Flows, Paper Prototype, Interactive Wireframe, Unity Prototype, User Testing, Contextual Research. We began by testing multiple apps on the Microsoft app store to understand how designers are currently approaching developing for the Hololens. In order to understand the needs of the users we were designing for, we also conducted studio visits to observe how each artist works, the tools they use and to interview them about about what they wanted their audience to experience when visiting their site. I worked on the set of questions for the interviews and conducted a visit to Tony Dove's studio. We brainstormed all the functionality that we might need to have within the app and I created a digital version of the mind map that described our ideas. Along with the group, I began developing ideas for the types of interactions that we could explore with the Hololens and found that storyboarding was helpful in communicating these ideas, as they involved movement and concepts of uncovering hidden information. These ideas were then explored in paper prototype form. Through the ideation and prototyping phases, we developed driving principles that guided our final design. Metaphors are used often in technology: they are called skeuomorphisms. They are used to create intuitiveness and familiarity. In MR, because it consists of both virtual and real elements, skeuomorphisms and metaphors are reinvented. This new medium allows us to use our embodied memory to understand metaphors that would otherwise have to be more literal in a completely virtual environment. In MR we experimented with various iconographic implementations of the navigation bar to see if we could use metaphors in a more abstract way. To fully immerse a user in the MooR experience, we incorporated Body Activation to our app. Instead of only depending on a user’s gestures as a source of their input, Body Activation is an input type that considers a user’s movement, placement, and gaze in the context of the environment and hologram layout. This is the method of having physically located zones initiate unique events or functions by either a user physically stepping into one or gazing upon one. In terms of activation of the space, we then considered the environment that the user would be interacting with. What is the user’s attention being drawn to? What would be a surprise element that could delight the user? What information is being revealed? How long would they want to spend in the space? Waypoints are tools for developers to allow the users to check in with the system and navigate it. They act as a reference point and a safe place. An example of a good Waypoint in a complex navigation system are Departure and Arrival boards at the airport. We began to think of the site as rooms, with the user arriving at lobby, and then having the option to visit various artist's studio rooms. The Waypoints became physical landmarks such as exits, presenting an opportunity for developers to provide breadcrumbs and system navigation. We also wanted a novel way for users to visit each artist's studio room and were inspired by the use of Portkey's in Harry Potter. Interaction Flow: Before delving into the development of the app itself, I took some time to refine the interaction flows that we would use in the app. We separated the interactions into movement and gesture based, then determined what feedback the app would provide the interaction. I also worked on a floorplan as we felt that how we oriented the user when they entered each artist studio would be important. The major waypoints of the artist desk, the artwork activation zones and exit zones are explained to you. Generally when entering a gallery, the user is greeted by a large artwork and some description about the piece. Information about the artist is usually accessible, but usually is less prominent and takes less hierarchy to the work itself. Similarly in our app, upon entering each scene, the user is facing the art, with the desk and the exit waypoints situated behind the user. This is so as not to distract the user from the art, and when they are done exploring the art, they know that the information they need is behind easily accessible. User Testing: I used Unity, a game engine, to develop the app. In the process of development, we conducted multiple user tests to gain feedback on the user flow of the app, the placement of elements in the room, they metaphors that we were using to represent the navigation bar and the effectiveness of the waypoints. The lobby functions firstly as a usual waypoint to guide people to their destination artist rooms. The second function of the scene is to familiarize the users with the metaphors that we are using throughout the app. The user is encouraged to select a key to scan with the Hololen's camera, which is either an object, image or material relating got he artworks, to enter that particular artist’s studio. This employs a Unity Library Plugin called Vuforia, which is an image and object recognition library. The user is encouraged to move around the studio, exploring the works. Upon entering various activation zones, they are rewarded by hidden information being revealed, such as animations of an artist's process, or the ability to interact with the artwork through gesture, as the original artworks afford. Tom Shannon uses a large swinging pendulum as an apparatus to create his paintings and we were able to show this within his studio when a user came close to one of his paintings. Toni Dove's Dress that Eats Souls responds to your gaze in using a Microsoft Kinect. We were able to introduce this in her studio, as well as have the dress respond in a robotic manner upon selection. When you want to learn more about the artist, users can approach the desk just behind you, which also activates upon approach. We employed lighting over the desk to indicate to the user that they have activated the desk. Once at the desk, the user can find out more about the artist, their practice, past and future events as well as get in contact with them through hovering their gaze and then airtap to select. Deploying the concept of skeuomorphism in MR, we wanted to use that familiar concept of the user leaving the room. Users can leave a studio through a large archway with an exit sign to get back to the lobby, where they can choose another key to visit the next studio. 1. The user's eye-line should match the key sightlines. We would first place our objects there and then adjust accordingly. 2. Key views of a scene should remain visible from some point in the room. 3. Users tend to want to see a moment all encased in their field of view. We achived this by adjusting the scale of objects to fit in the viewport and enabling a teleporting function that allows the user to move beyond their physical space. 4. Certain artists' works may require placing objects or moments on the floor. However, doing so requires prompting as many users do not naturaly want to look down. 5. If users need to be moved through or around a space, use pointers or other wayfinding attention grabbers. 6. The location of the ground is more important than where the walls are. In the case of not using spatial mapping, we made sure to at least calibrate a scene against the actual ground of the room.